DON’T PANIC! DO YOU KNOW WHAT TO DO IF YOUR DOG IS ATTACKED? One morning this week, one of our puppy clients went to the park with their young dog. As per our directions, they sought out and found an area of the park where there were no other dogs where they could safely play with their puppy. A few minutes into their play, along came another car, which stopped and before they could catch their pup or even grab their leash to do so, the driver opened her door and two big dogs leapt out and immediately charged and grabbed the puppy. The puppy they waited for. The puppy they dreamed about. 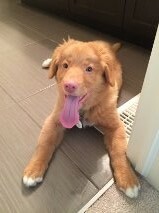 The puppy they are bringing to puppy class to help ensure he is going to grow up to be a behaviourally normal dog. The puppy they hoped would never have the behaviour problems they experienced with their previous two dogs. My clients watched in horror as their pup was picked up and shaken. Although there was no blood, after the owner of the attacking dogs left, they found their pup had sustained very serious wounds to his neck. Now they are facing the risk that their puppy won’t be as trusting of other dogs as he once was, or worse that he will be so afraid that he will be defensively aggressive towards dogs he doesn’t know. We have sent out a call to everyone we know through the school to help this youngster and we have a plan to address his trauma. Before the attack, this was a completely behaviourally normal puppy. The question we have now, is can we help him to return to this state? We hope so! If this happened to your dog, or child or to you, would you know what to do? The first thing to do is to not panic. This is an emergency we hope never to have to deal with but the truth of the matter is that it happens from time to time and if you have a plan, you are in better shape than if you have to make up your response as you go along. The next thing to do is to evaluate the situation. Many, many attacks are rude greeters who will not pick up and shake another dog. 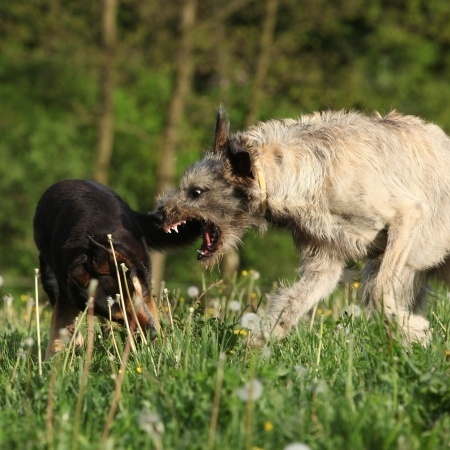 Some though are not that straightforward; if your dog is in the mouth of another dog, you must do whatever you can to stop the attack, but balance that off with protecting yourself. Citro-spray, canned air, an airhorn or mace can all break up fights if used well but how many of us actually carry that stuff and how many of us know how to use it effectively? You can also use your leash and put the handle around the waist of the attacking dog and drag him backwards, but again, this is not always a safe tactic. Screaming may attract help from by standers, but it may also ramp the dogs up. Having broken up two actual fights, I can tell you that even for the pros, this is a difficult feat and sometimes the only thing you can do is to wait it out until the fight is over. If at all possible at the very least, get the other owner to catch his or her dogs. Usually if you can contain the attacking dog, the other dog will back off and get out of harm’s way. When there is a significant size difference, and the larger dog is showing signs like his tongue pulled all the way back into his mouth and whale eye, I know I am not looking at a dog who wants to play. This is a risky situation and you bet I would do whatever I could to get my puppy out of this situation if I could. Once the incident is over, offer your information and make sure you get the other owner’s information and let them know that you will need to see the other dog’s rabies certificate. While you are doing that begin your check over your dog’s neck and body for bite wounds. They may not bleed, so look very carefully especially if your dog has a thick coat. Black haired dogs sometimes have a lot of blood in their coats and you cannot see it against the dark fur, so wipe your hands through your dog’s coat. In the event that the person who owns the other dog is unwilling to share their information, use your phone to get a picture of them so that you can go to the police and get help finding them. Let the person know that you are taking their picture; this may short change their reticence about sharing their information. If you do have to go to the police, get them to help you to get the rabies certificate information. Later on, if you want to pursue financial recourse to offset veterinary costs, then you will have the information you need to do that. If there are injuries, seek veterinary attention sooner rather than later. Fresh injuries have the greatest chance for healing if they are attended to properly, so get medical care right away; don’t wait. This is one of the occasions where I am always glad that we keep muzzles in the truck; if my dog is badly injured, I may choose to muzzle him while I am examining him. Even the kindest and sweetest dog will bite if he is in pain; it is the only way he has to defend himself if what you are doing causes even more pain. After he saw the vet, our young friend has been visiting other safe, quiet dogs to regain his confidence. We will keep doing that. Thanks to the vets who patched him up. He had some pretty serious wounds! Teaching a dog to wear a muzzle is an important skill and it is very easy. Take a coffee cup, yoghurt container or other long narrow container and smear something soft and tasty within it. Offer it to your dog to lick off the bottom. Keep practicing until when you offer the cup, your dog shoves his face right into the cup. At that point you can start to reward your dog after he puts his nose in. Transfer this skill to the muzzle and you are good to go. D’fer cut his pad REALLY badly once. 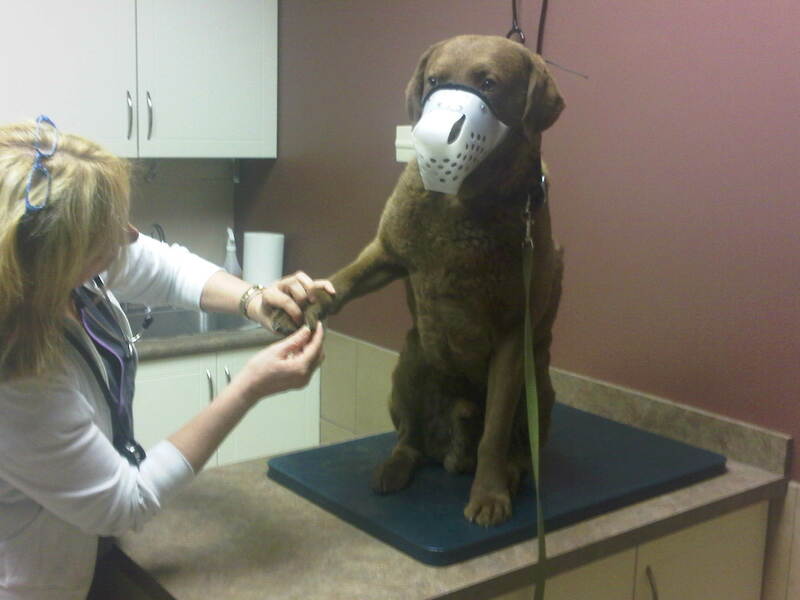 Although he didn’t snap at the vet, I didn’t want to take any chances so I put on his muzzle so that the vet could do her job. Although he didn’t love wearing his muzzle or having his injury looked at, he stayed calm and accepting throughout the examination. They had to anesthetize him to repair the injury. Once the traumatic event is over, and veterinary care has been sought out, then it is time to start to think about the future. This is where you make sure that you have been taken care of as much as your dog has! Seek support from friends and family and don’t be surprised if you are upset for days or even weeks after an attack. If your own trauma goes on for an extended period of time, seek out professional help. You have observed something that is likely going to upset you. Get help if you need it. As a final note after your dog has been examined by a veterinarian, you may have to help him to learn to trust other dogs again. For this pup, we have introduced him to a gentle adult lab who held a down stay while the puppy was permitted to sniff him all over. I sat at the lab’s head and fed the lab for tolerating such a long look by a young puppy in a cone. Everything went off without a hitch because we chose the right dog and I carefully supervised the dog all the way through the event. Then we brought the pup to puppy class and we sat on the floor with the puppy and allowed him to greet his friends over our arms. After he had a chance to greet his friends, he was taken home. This week we will be allowing him to visit every puppy class we run to do more of the same. When his physical wounds heal, we will start to carefully introduce him to selected well behaved dogs and re-introduce him to play with other dogs. It will be important in the coming weeks for him to have hundreds of great and safe experiences with other dogs and teach him that if he is scared he can rely upon his people to take care of problems for him. ← HOW DO WE KNOW?